SALEM, OR -- The 2019 Legislative session begins Tuesday. But first, this week, all lawmakers are taking part in mandatory training to recognize, combat and report harassment. 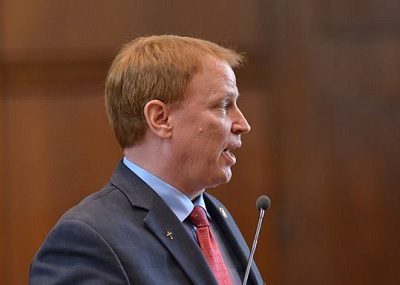 State Senator Tim Knopp (R-Bend) says for too long, certain powerful people were allowed to create hostile work environments for women and minorities, with no one calling them to task, "That culture must end and it has to end now. And, it's up to all of us to join together and say it's not going to be tolerated anymore." He tells KBND News, "I mean, it's the silence that has allowed all this stuff to continue." Knopp was outspoken when allegations involving former State Senator Jeff Kruse emerged nearly a year ago. He says there's no room for harassing and disrespectful behavior in the Legislature or anywhere else, "I think we're at a critical moment in our culture when we have the opportunity to do some real good out of what has been a very ugly year of revelations all across the country; in many state houses, and Hollywood, board rooms, and companies, large and small, all across Oregon and America." The Bend Republican is Vice Co-Chair of the new Joint Committee on Capitol Culture and he's sponsored a bill that would change laws regarding sexual harassment allegations. It would extend the statute of limitations beyond 365 days, create liability for those who know about harassment and do nothing, disallow confidential settlements that silence the accuser and prohibit a company from firing an alleged victim just for coming forward. Knopp says, "I look forward to working with my colleagues to set an example of the type of workplace that we all should have here in Oregon." He adds, "Nobody is held accountable publicly. So now that that is going to occur, I think it will have a marked difference and change in behavior now that people know what the consequence is going to be."